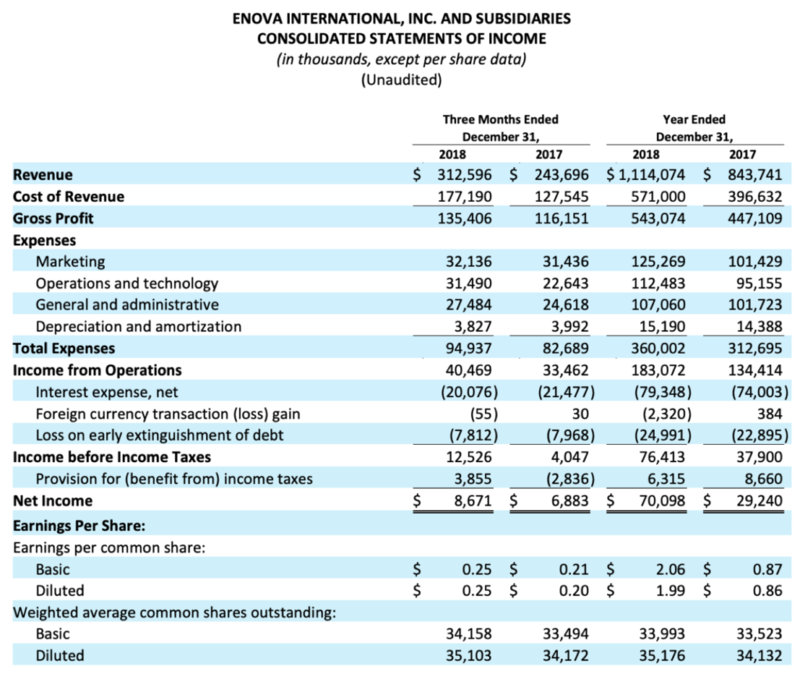 Enova Reports Fourth Quarter and Full Year 2018 Results - Enova International, Inc.
CHICAGO (January 31, 2019) — Enova International (NYSE: ENVA), a leading financial technology and analytics company offering consumer and small business loans and financing, today announced financial results for the quarter and year ended December 31, 2018. Total revenue of $313 million in the fourth quarter of 2018 increased 28% from $244 million in the fourth quarter of 2017. Gross profit margin was 43.3% in the fourth quarter of 2018, compared to 47.7% in the fourth quarter of 2017. Net income of $8.7 million, or $0.25 per diluted share, in the fourth quarter of 2018 increased from $6.9 million, or $0.20 per diluted share, in the fourth quarter of 2017. Fourth quarter 2018 adjusted EBITDA of $48 million, a non-GAAP measure, increased from $38 million in the fourth quarter of 2017. Adjusted earnings of $18.2 million, or $0.52 per diluted share, a non-GAAP measure, in the fourth quarter of 2018 increased from adjusted earnings of $8.9 million, or $0.26 per diluted share, in the fourth quarter of 2017. Total revenue of $1.114 billion in 2018 increased 32% from $844 million in 2017. 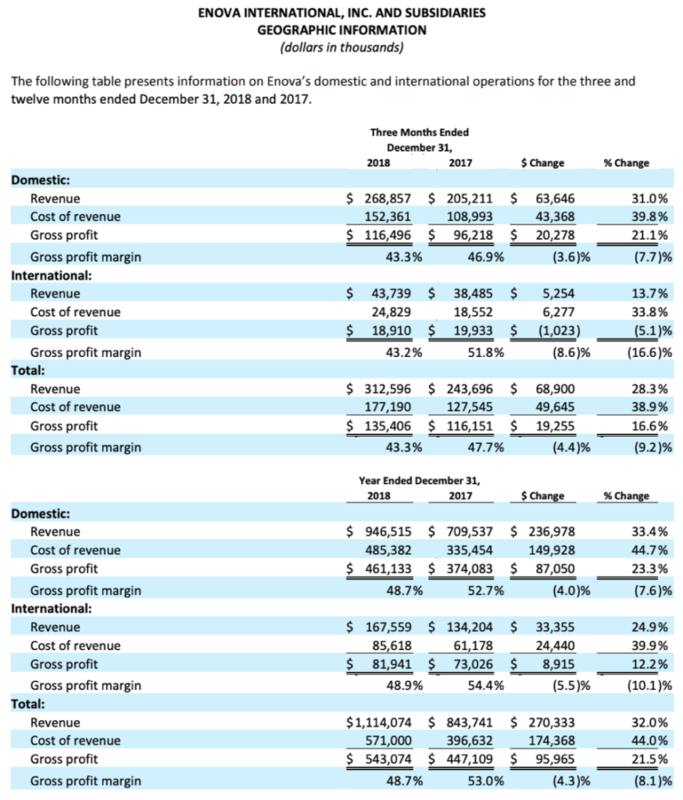 Gross profit margin was 48.7% in 2018, compared to 53.0% in 2017. Net income of $70 million, or $1.99 per diluted share, in 2018 increased from $29 million, or $0.86 per diluted share, in 2017. Adjusted EBITDA of $211 million, a non-GAAP measure, in 2018 increased from $158 million in 2017. 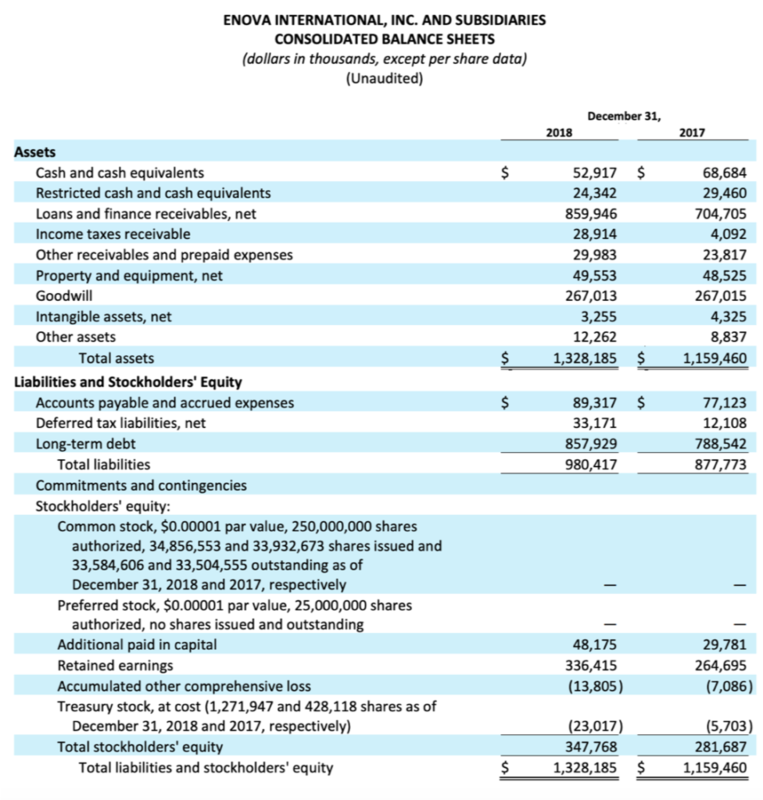 Adjusted earnings of $91 million, or $2.58 per diluted share, a non-GAAP measure, in 2018 increased from adjusted earnings of $47 million, or $1.37 per diluted share, in 2017. Enova ended the fourth quarter of 2018 with unrestricted cash and cash equivalents of $53 million. As of December 31, 2018, the company had total debt outstanding of $858 million, which included $116 million outstanding under Enova’s $575 million securitization facilities. During the fourth quarter, Enova generated $217 million of cash flow from operations. Enova completed its previously announced $25 million share repurchase program earlier this year. During the first quarter of 2019, the company’s Board of Directors authorized a new share repurchase program for up to $50 million of Enova’s outstanding common stock through December 31, 2020. For the first quarter of 2019, Enova expects total revenue of $280 million to $300 million, GAAP diluted earnings per share of $0.78 to $0.99, adjusted EBITDA of $63 million to $73 million and adjusted earnings per share of $0.85 to $1.06. For the full year 2019, Enova expects total revenue of $1.25 billion to $1.31 billion, GAAP diluted earnings per share of $2.49 to $3.13, adjusted EBITDA of $230 million to $260 million and adjusted earnings per share of $2.76 to $3.40. Enova will host a conference call to discuss its results at 4 p.m. Central Time / 5 p.m. Eastern Time today, Thursday, January 31st. The live webcast of the call can be accessed at the Enova Investor Relations website at http://ir.enova.com, along with the company’s earnings press release and supplemental financial information. The U.S. dial-in for the call is 1-855-560-2575 (1-412-542-4161 for non-U.S. callers). Please ask to be joined to the Enova International call. A replay of the conference call will be available until February 7, 2019, at 10:59 p.m. Central Time / 11:59 p.m. Eastern Time, while an archived version of the webcast will be available on the Enova Investor Relations website for 90 days. The U.S. dial-in for the conference call replay is 1-877-344-7529 (1-412-317-0088). The replay access code is 10127834. The combined loans and finance receivables measures are non-GAAP measures that include loans and finance receivables that Enova owns or has purchased and loans that Enova guarantees. Management believes these non-GAAP measures provide investors with important information needed to evaluate the magnitude of potential receivable losses and the opportunity for revenue performance of the loans and finance receivable portfolio on an aggregate basis. 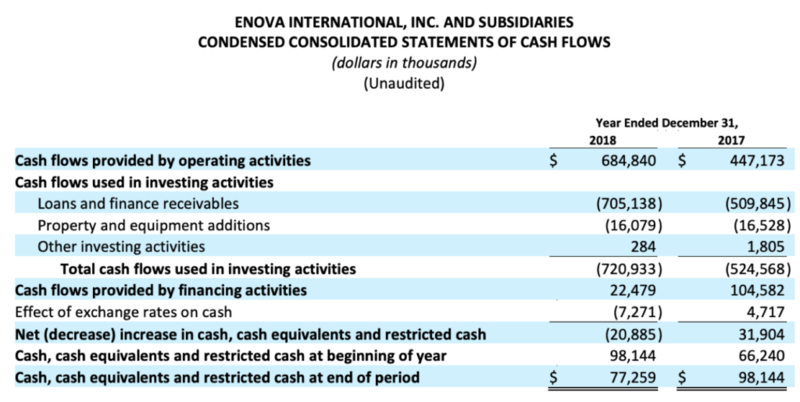 Management also believes that the comparison of the aggregate amounts from period to period is more meaningful than comparing only the amounts reflected on Enova’s consolidated balance sheet since both revenue and cost of revenue are impacted by the aggregate amount of receivables owned by Enova and those guaranteed by Enova as reflected in its consolidated financial statements. 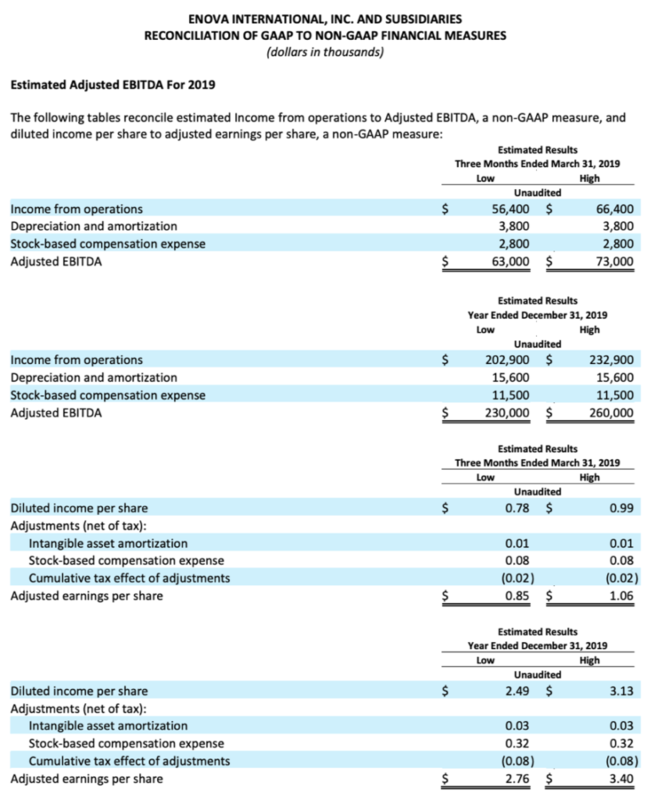 In addition to reporting financial results in accordance with GAAP, Enova has provided adjusted earnings and adjusted earnings per share, or, collectively, the Adjusted Earnings Measures, which are non-GAAP measures. Management believes that the presentation of these measures provides investors with greater transparency and facilitates comparison of operating results across a broad spectrum of companies with varying capital structures, compensation strategies, derivative instruments and amortization methods, which provides a more complete understanding of Enova’s financial performance, competitive position and prospects for the future. Management also believes that investors regularly rely on non-GAAP financial measures, such as the Adjusted Earnings Measures, to assess operating performance and that such measures may highlight trends in Enova’s business that may not otherwise be apparent when relying on financial measures calculated in accordance with GAAP. In addition, management believes that the adjustments shown below are useful to investors in order to allow them to compare Enova’s financial results during the periods shown without the effect of each of these expense items. Adjusted EBITDA is a non-GAAP measure that Enova defines as earnings excluding depreciation, amortization, interest, foreign currency transaction gains or losses, taxes and stock-based compensation. In addition, management believes that the adjustments for losses on early extinguishment of debt, certain acquisition-related costs and a discrete regulatory settlement shown below are useful to investors in order to allow them to compare our financial results during the periods shown without the effect of the expense items. Adjusted EBITDA margin is a non-GAAP measure that Enova defines as Adjusted EBITDA as a percentage of total revenue. Management believes Adjusted EBITDA Measures are used by investors to analyze operating performance and evaluate Enova’s ability to incur and service debt and Enova’s capacity for making capital expenditures. Adjusted EBITDA Measures are also useful to investors to help assess Enova’s estimated enterprise value.